Apple has just made available to download iOS 10.3.3 beta 1 for iPhone and iPad, macOS 10.12.6 beta 1 for Macs, tvOS 10.2.2 beta 1 for Apple TV and watchOS 3.2.3 beta 1 for Apple Watch. 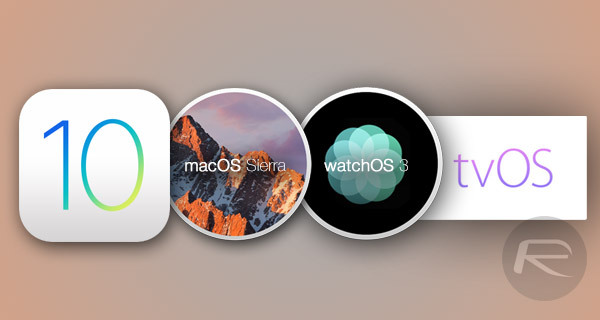 This release of iOS, macOS, tvOS and watchOS comes only a day after the company released final versions of iOS 10.3.2, macOS 10.12.5, tvOS 10.2.1 and watchOS 3.2.2. As things stand at the moment, the release of the aforementioned versions of Apple’s major platforms manages to blindside most people. It’s for that reason that the extent of the changes, improvements, and any enhancements are currently unknown. Of course, as time progresses, and as people have a chance to interact with the release, we will know more. This particular beta release follows hot on the heels of Apple releasing the final public version of iOS 10.3.2. Given the fact that it is a minor point release and the fact that we are likely to see an initial seed of iOS 11 in less than three weeks during WWDC, it’s highly likely that iOS 10.3.3 is nothing more than a stabilizing point release to fix any issues identified with the public version of iOS 10.3.2. As we know and understand more we will surely bring it directly to you. Developers can grab the first beta of iOS 10.3.3 from developer.apple.com right now, or as an over-the-air update if a pre-release profile is currently installed on the device from Settings > General > Software Update. Update: iOS 10.3.3 public beta 1 is now available to Apple Beta Software Program testers at beta.apple.com. Like iOS 10.3.3, macOS 10.12.6 beta 1 looks initially to be a minor point release with limited inclusions of functionality improvements. Given the close proximity to WWDC, it is very likely that this release simply looks to try and provide a better overall experience to all Mac hardware owners opting to make the move across to 10.12.6. This latest pre-release seed of macOS can be downloaded directly from Apple Developer website, or via the Updates tab in the Mac App Store. Update: macOS 10.12.6 public beta 1 is now available to Apple Beta Software Program testers at beta.apple.com. tvOS is one of Apple’s fastest-growing platforms, and as such is one that users are continually keeping an eye on for improvements and updates. Apple has done a wonderful job of progressing tvOS so quickly in such a short space of time, but this latest release slows the wheels a little by being all about patches and under-the-hood improvements abstracted away from the end user. This latest beta version of tvOS for Apple TV can be grabbed right now via software update mechanism found in tvOS settings. Just like all of the other pre-release versions that we have seen today, watchOS 3.2.3 appears to be nothing more than a minor update complete with bug fixes and stability improvements for all Apple Watch owners. Following quickly from the release of watchOS 3.2.2, this particular version is likely the precursor to the release of watchOS 4 at next month’s WWDC. Developers are able to grab the latest pre-release seed of watchOS right now from companion Watch app on a connected iPhone as long as the device has 50% power and is plugged into a power outlet.